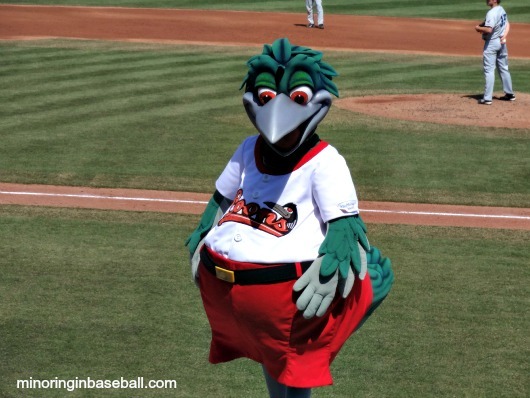 Yes, it’s that time of the year again when we get to vote for the very best of Minor League Baseball this past season. As usual, a few of the local players made the list. I’ll be voting as much as possible, and hoping some of them can bring home an award or two. 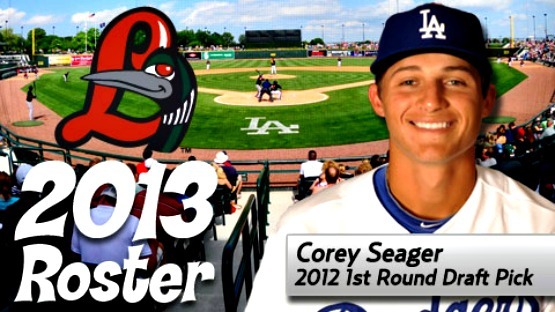 Top Offensive Player: Former Great Lakes Loons short stop Corey Seager had a fantastic season for the High-A Rancho Cucamonga Quakes. 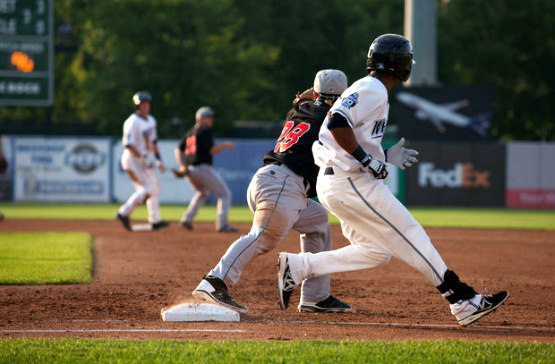 He led all of the minors with 50 doubles, and was tied for first with a .349 batting average. Throw in 20 home runs and 90 RBI’s, and you have a player worthy of being named a top offensive player. Breakout Prospect: Most Tiger fans knew outfielder Steven Moya was a top prospect going into the season, but he really earned that moniker in 2014. Hitting .276 with the Double-A Erie Seawolves, he also belted 35 home runs and drove in 105. He also showed some speed, stealing 16 bases this season. Those stats were good enough to be named the Eastern League MVP, but will they be good enough to be the breakout prospect? As a former West Michigan Whitecaps, he’ll be in completion for that crown with hurler that pitched for the ‘Caps this season. 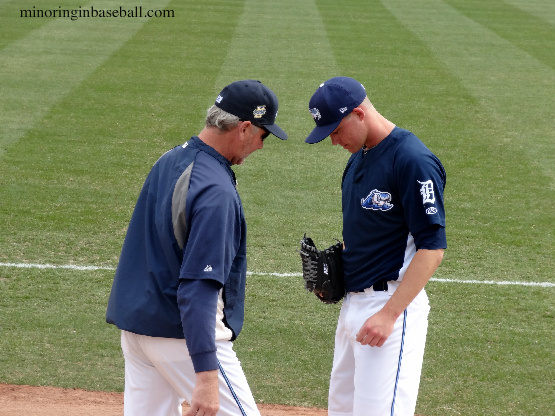 Kevin Ziomek quickly moved up the Tigers prospect list with his accomplishments this season. A member of a rotation stacked with top prospects, he led the Midwest League with a 2.27 ERA, and his 152 strikeout were second in the league. With is 10-6 record, he can certainly be considered a breakout prospect. 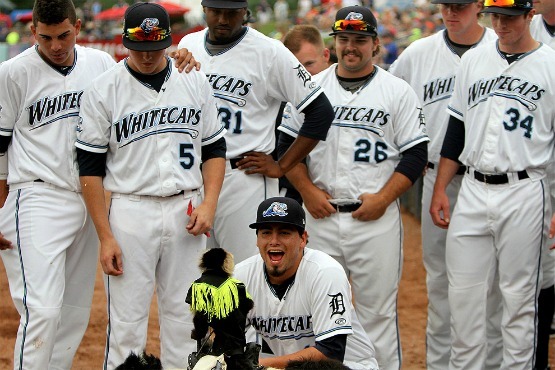 Photo of the Year: No monkey business here, as the ‘Caps are up for the photo of the year award. The above photo was taken during one of the promo nights (Team Ghostrider) where the monkeys ride around on dogs and heard sheep. We didn’t get to see the act this season, but last year in West Michigan. It’s a funny photo and I’m voting for it to win! You can vote for your favorites HERE. MiLB.com: It seems like this was a really big year for you on a lot of different levels, with you doing what you did in your first full pro season, with the Dodgers having the season they had and with the success of both of your brothers. Have you felt like it’s all been kind of a magical stretch? 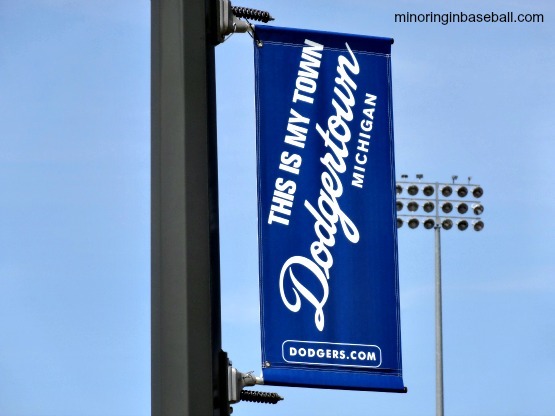 Corey Seager: Yeah, you know, it feels like it’s been really crazy, actually. This was [Kyle’s] second full year in the Majors and he was looking to have a good year like he did. For me, I didn’t really have any expectations for myself other than to just play hard every day all season, and I ended up having a good year. I was just trying to get through the season. And it was awesome to see my middle brother get drafted and go to the Mariners and be in Kyle’s organization. MiLB.com: How much are you able to pay attention to what they’re doing on any given night or week during the season? Seager: I checked up on my eldest brother [Kyle] every night. We texted or talked every night or almost every night. I kept up with my middle brother [Justin] every week, usually on the weekend. When he was in school, it was hard to follow what he was doing when he had games in the middle of the week. But I’ve gotten really close to both my brothers over the last couple years. We’ve spent more time talking to each other and keeping up, and it’s been really fun. MiLB.com: And what about following what goes on at the big league level? Obviously, your job is to stay locked in on your game, but, for example, when the Dodgers went on a 42-8 run, how tuned into that were you? Seager: Yeah, I definitely follow the Dodgers. I was checking the box score every night. My brother [Kyle] gave me the good advice not to ever look ahead. He told me, ‘Make every level your Major Leagues. Don’t push, stay in the moment.’ That’s really good advice. I definitely checked the box scores but not for any other reason to see what they were doing. I checked, but I didn’t put much thought into what might be going on with them. MiLB.com: Having so much going on on the periphery could be overwhelming for some players your age. Do you have to get into a certain mind-set to only take from that stuff the time and energy that will help you? Seager: Yeah, for sure. You never want to root against anybody or anything like that, but you can’t get caught up in somebody else’s game. You root for everybody, but you really need to remember that the most important thing, by far, is to handle your own business. MiLB.com: Since Justin joined the Mariners system, are you feeling a little outnumbered in the family? 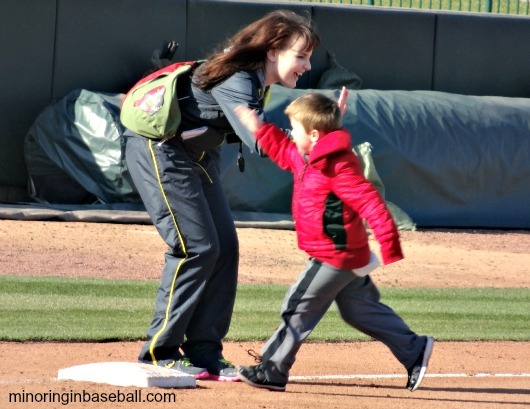 Are your parents going to root for Seattle harder than L.A.? Seager: I’m pretty sure I’m going to get ganged up on during the holidays. That’s probably going to happen. But I was really excited for [Justin] when he got drafted. And I’m really looking forward to working out with both of them during the offseason. That should be good. 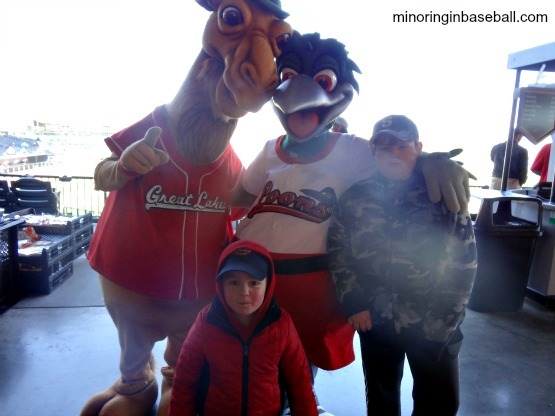 MiLB.com: Have you guys ever been on different teams in the same league growing up or did the age differences keep that from happening? Seager: I’ve never played against them. I played with my middle brother in high school for two years but never against either one of them. If that happens, it definitely will be weird. MiLB.com: Speaking of high school, when you were drafted last summer, were you tempted at all to go the college route? Or after you went where you went in the first round, did you know you wanted to jump in and start working on improving your game full-time? Seager: You know, I was really excited to go to [the University of] South Carolina and I had a good relationship with South Carolina. I told them ahead of time, if it happens that I’m drafted between this spot and this spot, I’m going to sign. It did happen that I got drafted in those spots and once it happened, I was really glad it wasn’t [on the cusp of my limits], because that would have been a hard decision and I would have really had to think about it. MiLB.com: Did you know what you wanted to study, if you were going to go to South Carolina? Seager: Not really. That was something I was still kind of thinking about, still deciding. 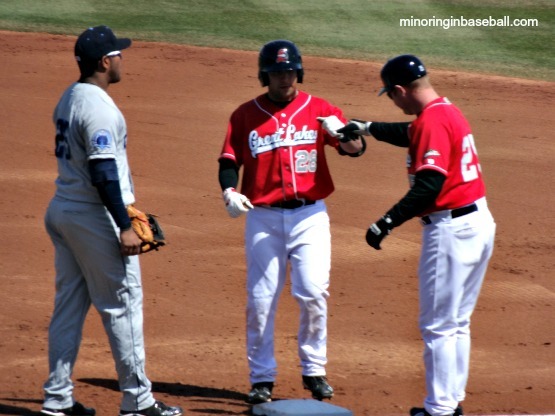 MiLB.com: What you’ve been able to do as a pro shows you were ready. You had a pretty darn good first full season. Looking back, is there anything you would have liked to have done differently or any particular part of your game you wish you’d been able to develop more? Seager: I had a pretty good year, fortunately. There’s not one specific thing I can look at and say I wish I’d done much better. Obviously, you’re always looking to improve on everything. I want to get faster on defense, get to some more balls and just kind of my overall game — there’s all kinds of things I want to improve on overall. MiLB.com: Is that really what this experience in the AFL is all about for you? Seager: Yeah, it’s a little bit of a quicker game. I’m getting used to that and working on improving everything against better quality players. MiLB.com: I’ve heard that the AFL can be especially tough on guys who haven’t faced Double-A pitching before, because there are so many pitchers who can get younger batters to chase breaking pitches that start in the zone. Has that been kind of a challenge? Seager: Yeah, for sure. Everybody here is a top guy in his organization. Every pitcher has good quality off-speed stuff and throws well and hits his spot. There’s a real difference with the control they have over all their stuff. I’m always hoping to swing at a strike, and [facing this high-quality pitching] changes your approach a little bit. You’ve got to be a little quicker. And you’ve also got to be quicker on defense. I think this is really improving where I’m going defensively. MiLB.com: Is it kind of weird to be down there playing right now? The World Series just ended and now you guys are kind of the only game in town, the only pro ballplayers still playing competitive games in the States. Seager: Well, I don’t know. It’s just, my year hasn’t ended. I’m grinding out the year. It’s definitely a little weird, kind of a weird feeling. MiLB.com: And for a guy who’s just had his first full season — you’ve been playing almost every day for about eight months now, right? Seager: This is definitely the longest I’ve ever played consistently. Everybody here is a little bit nicked up or has a little bit of fatigue. We’re all just trying to grind out at-bats and play the game right. A little fatigue is a part of it for everybody here. 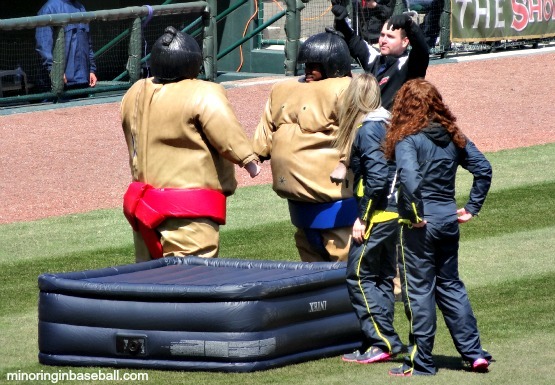 MiLB.com: What’s the most fun you’ve had with a team? Seager: Probably making the playoffs [this season], after playing that long season and then to get there. That was really fun. 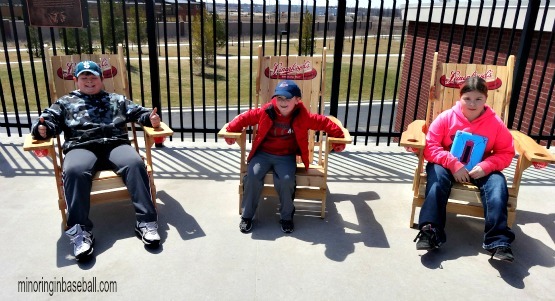 MiLB.com: Did you go to a lot of Minor League games in Kannapolis growing up? 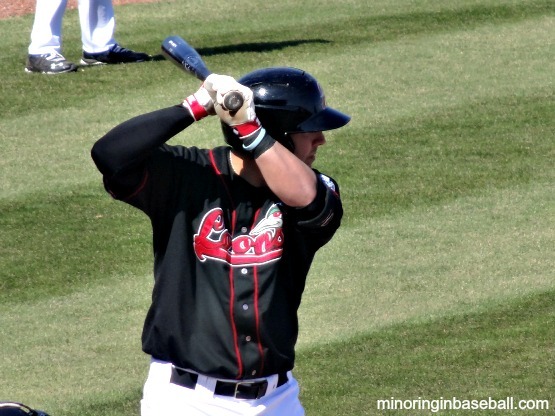 Seager: I went to a few Intimidators games but not many, really. I was pretty busy all the time playing ball as a kid, plus both my brothers were playing, so we were pretty busy during the baseball season. MiLB.com: Did you have a favorite Major Leaguer growing up? Seager: Derek Jeter, probably. I’d have to say Derek Jeter. MiLB.com: Yeah, for a shortstop, that’s probably going to be the answer, right? Seager: Well, yeah, he’s a good guy and he’s a good all-around player — he does everything right on the field. MiLB.com: And if you weren’t a pro ballplayer, do you know what you’d want to be doing for a living? Seager: Not really. No, I can’t answer that question for you. Sorry. 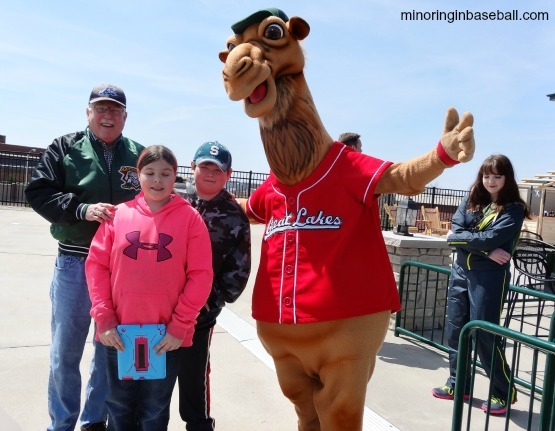 It’s that time of year, where Minor League Baseball lets the best fans in the world vote their best Minor League moments, plays, bloopers, players, and so one. It’s simply time for the MiLBY Awards. 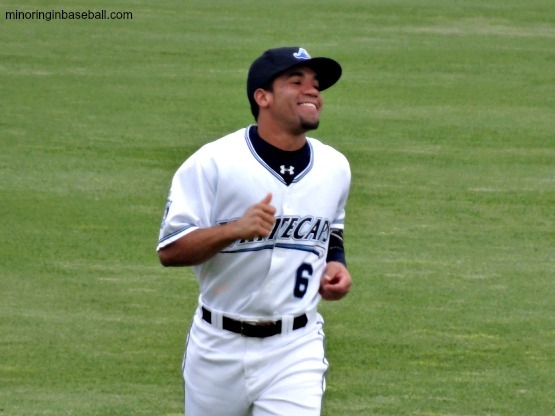 Up for two of these awards is former West Michigan Whitecaps second baseman Devon Travis, who was promoted to the Lakeland Flying Tigers in late June. The awards that he’s in the running for, are the Offensive Player of the Year and Breakout Prospect of the Year awards. 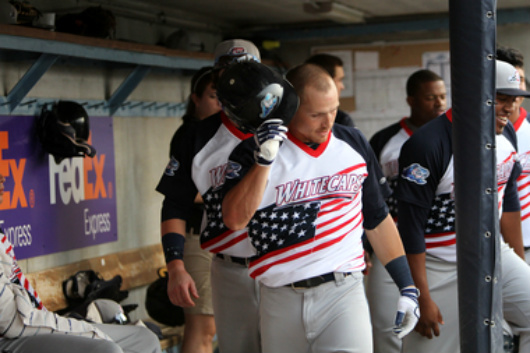 Travis batted .352 during his time in West Michigan, and .350 in Lakeland. His combined .351 average was the best in Minor League baseball for anyone with at least 350 at-bats. Between the two leagues, he also contibuted 28 doubles, 16 home runs, 76 RBI’s, and 22 stolen bases. Travis was only one of five players in MiLB to hit .330 and steal over 20 bases. Also up for the Breakout Prospect of the Year Award, are short stop Corey Seager and pitcher Julio Urias of the Great Lakes Loons. 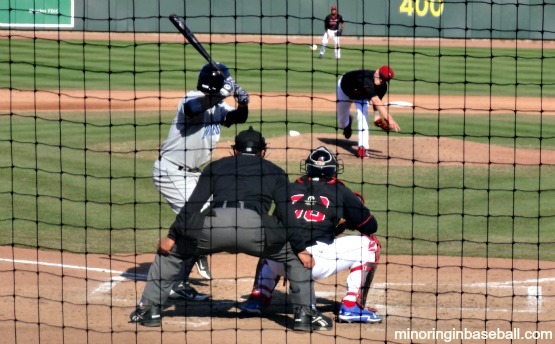 Seager lead the Loons with a .309 average, and was tied for home runs with 12, despite playing 27 games with the Rancho Cucamonga Quakes of the California League. He also hit 18 doubles and drove in 57 RBI’s with Great Lakes. Urias was one of the best rookie pitchers in the Midwest League, holding batters to a .206 average the second half of the season. The 16 year-old prospect struck out 11.9 batters per nine innings, a total of 67 on the year. 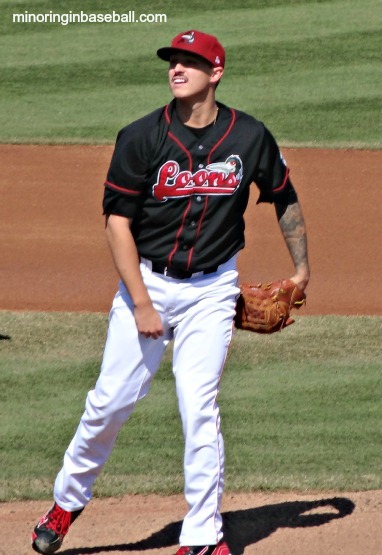 Urias had a 2-0 record in 18 appearances for the Loons. UPDATE: Travis won the Offensive Player of the Year and Breakout Prospect of the Year MiLBY awards, as voted by the fans. 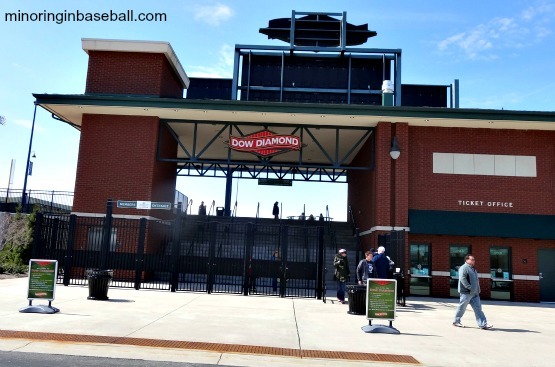 Dow Diamond–Midland, Michigan: The second game of our double-header was a little chillier, but we toughed it out anyway. 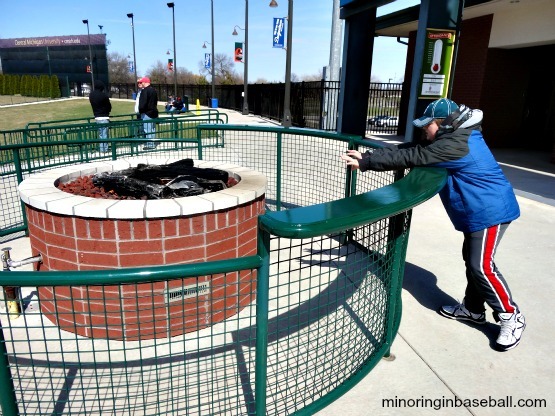 The kids stayed warm on the playground, and trying to get a game ball, which Brian finally did! He also gave the ball to Trevor, which I thought was pretty nice. Lily stayed warm by visiting the Loons’ Loft gift shop and Trevor hung out by the fire pit to get some heat. 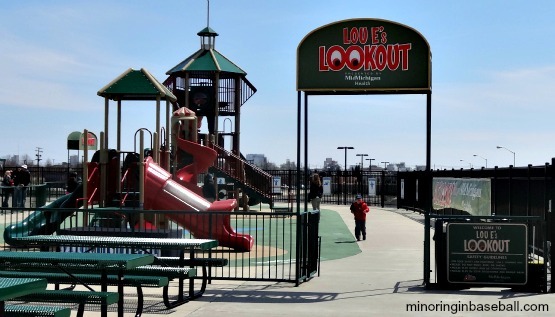 After all that, the kids were still up for some cold ice cream…go figure. 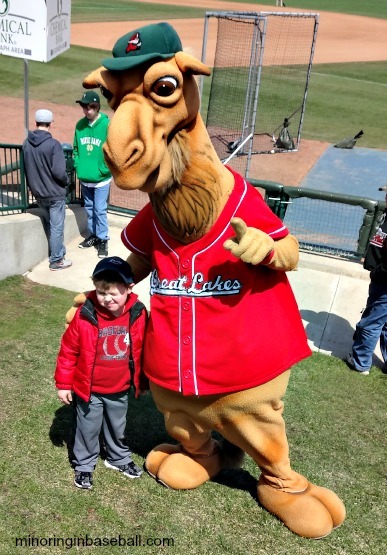 After the game Brian was able to run the bases at Dow Diamond, and he got a kick out of that, and being on the field with the mascots Lou E. Loon and Rall E. Camel. The game itself was yet another low scoring pitching duel, with Ralston Cash taking the rock for Great Lakes. 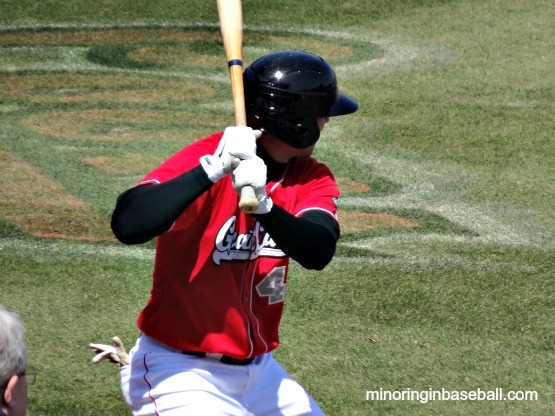 The Loons took an early lead this game, however, as Corey Seager singled in the second inning, than advanced to third on a Pat Stover single and a Captains’ error. Dashenko Richardo drove in the run with a sacrifice fly. In the fifth inning, James Baldwin got a bunt single, but advanced to third on another Captain throwing error. A Malcolm Holland singled scored the winning run. Cash earned the 2-1 victory for his team, going five and a half innings, giving up one run on one hit, and striking out eight. 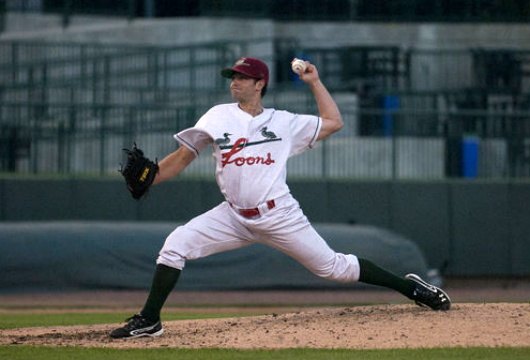 Luis Meza and Scott Griggs finished the game on the mound for the Loons. 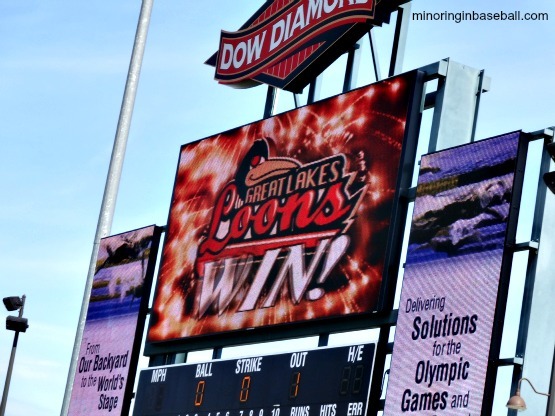 Final Score: Loons 2, Lake County Captains 1. 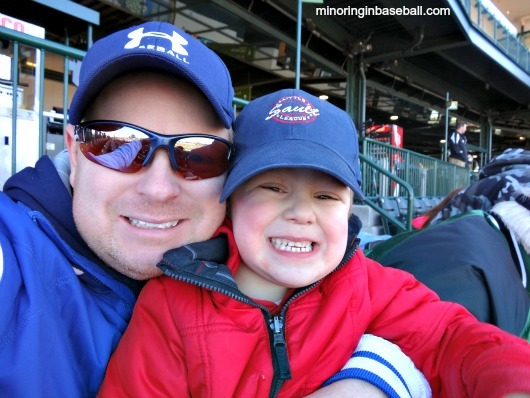 Brian and I enjoying the ballgame! 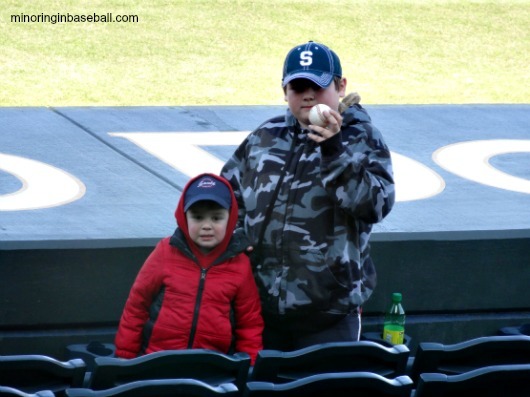 The boys got a game ball! 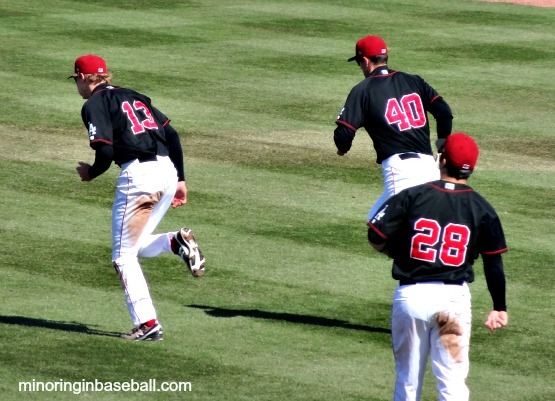 Rounding third and heading for home! After looking at the Loon’s opening day roster, it looks as if they have a pretty talent laden team. 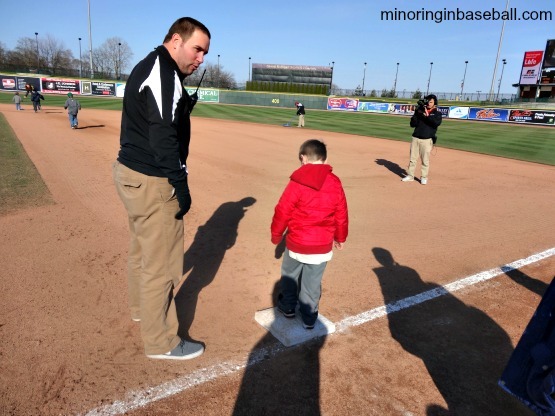 Manager Razor Shines, who has one of the coolest names in baseball, should have a successful season leading his charges at Dow Diamond. The team seems to have a pretty good mix of young talent and they return eight players from the 2012 roster. 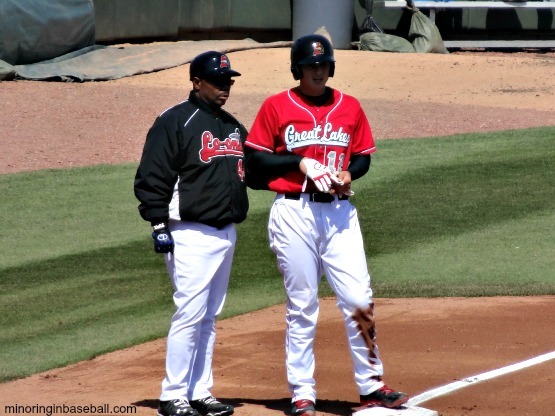 Possibly the player Loons fans may be most eager to see play, is infielder Corey Seager. 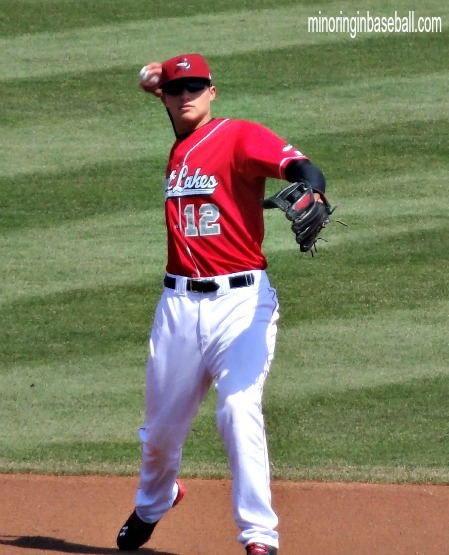 The Los Angeles Dodgers‘ top pick of the 2012 draft, 18th overall, Seager will play his first pro season for Great Lakes. He’s ranked by Baseball America as the Dodgers’ 3rd best prospect, is the first position player since James Loney (2002) to be a first pick for L.A. With this assignment, Seager becomes the highest drafted position player to ever play for the Loons. 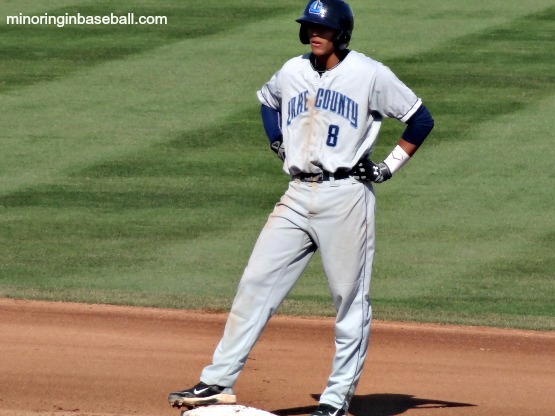 He joins five other prospects currently ranked by Baseball America on the Great Lakes roster. Pitching prospects include Scott Griggs (ranked 18th), Zach Bird (19), Angel Sanchez (25), outfielders James Baldwin III (22) and Jeremy Rathjen (29). 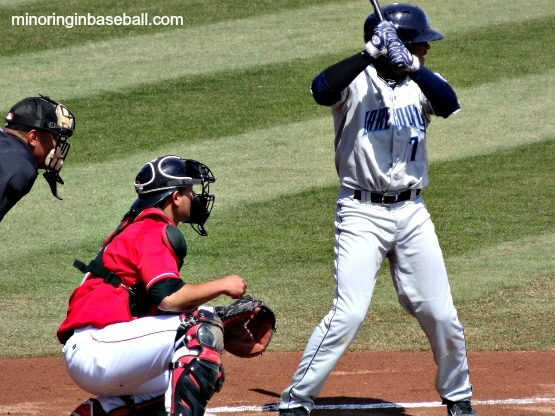 Baldwin and Griggs are two of the returning players, as well as pitcher Ralston Cash, Daniel Carela, Arismendy Ozoria, and Miguel Sulbaran, catcher Tyler Ogle, and outfielder Davin Shines, son of manager Razor. Sanchez also played for the Loons back in 2011. Also joining Shines in the dugout, are pitching coach Bill Simas and hitting coach Mike Eylward. 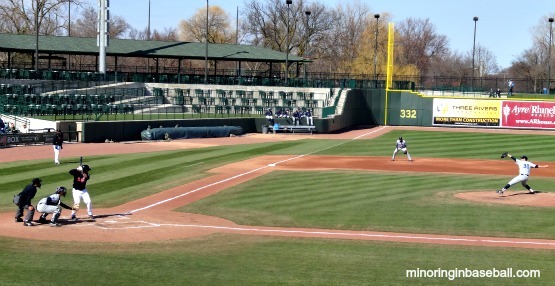 The Loons open their season at home on April 4th, hosting the Fort Wayne TinCaps. 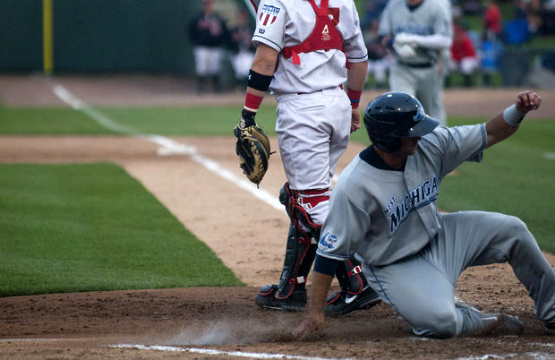 I expect to see some great games between the Loons and Whitecaps this season, as both organizations have their games on the MiLB.tv network. Less than a week away from the season’s start, it already looks like it could be a very entertaining one, if mother nature ever decides to stop punishing us. With another blanket of snow dumped on us, and blistering cold wind, it seems more like December 1st than April 1st…I guess the joke’s on us here in Michigan.